Sate those salty cravings with our NEW BBQ, Salt & Vinegar, and Spicy Nacho Cheese Chips, chalked full of 15 grams of protein and only 6 net carbs. 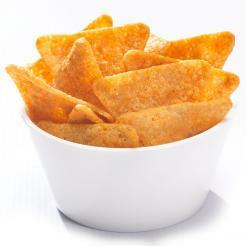 Our delicious, zesty chips are a great snack for every health conscious person, without all the empty calories. BBQ: Ingredients: Chips (soy protein concentrate, tapioca and potato starch, soy fiber, potato flakes, salt, sunflower lecithin), sunflower oil, dehydrated vegetables (onion, garlic, tomato), sea salt, organic sugar, smoked paprika (color & flavor), spices (mustard, black pepper), natural mesquite smoke flavor. Manufactured in a facility, that processes milk, egg, wheat, peanuts and tree nuts. 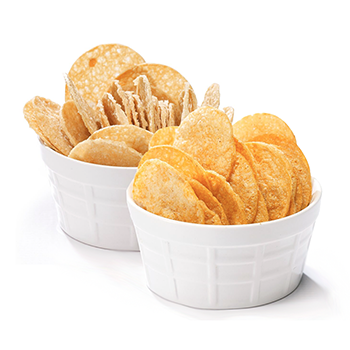 Salt & Vinegar: Protein blend (soy protein isolate, pea protein isolate), potato flour, high oleic sunflower oil, soy flour, potato starch, sodium diacetate, citric acid, natural flavors, yeast extract, calcium carbonate, salt, malic acid. Spicy Nacho Cheese: Protein blend (soy protein isolate, pea protein isolate), high oleic sunflower oil, tapioca starch, water, cheese powder blend (whey powder, whey protein concentrate, cheese powder [cheddar cheese (milk, bacterial culture, salt, microbial enzymes), natural flavor, disodium phosphate], torula, yeast, salt, autolyzed yeast extract, spice, citric acid, calcium silicate, spice extractive [paprika, turmeric]), soy fiber, salt, natural flavors, potato starch and dehydrated potato, dehydrated vegetables (onion, tomato, garlic), yeast extract, jalapeno pepper, sodium diacetate, sunflower lecithin, malic acid, citric acid, paprika, silicon dioxide.